Bring your family, friends, social and civic groups to an educational and fun museum tour! School groups + Field Trips are warmly welcomed and engaged in an interactive tour, led by our museum educators. Groups will appreciate the Contemporary Art + Public History exhibits on display, and can spend time in our Welcome Space + Buy Black Museum Gift shop. Experience the rich art, history and culture in Prince George’s County. Click here to RSVP for a tour. PGAAMCC’s On-Site Workshops are hands-on interactive arts workshops inspired by our exhibitions. Workshops are scaled by age group and are a perfect fit for participants of any age or skill level. 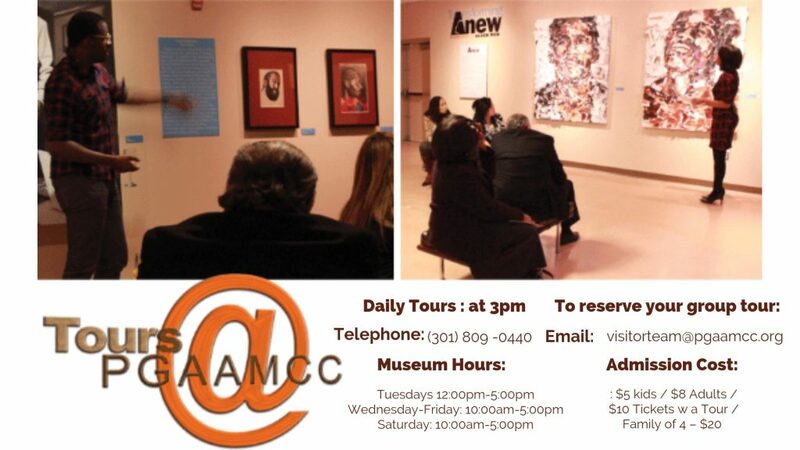 PGAAMCC’s Museum Tours are a fun and educational way for visitors to experience our exhibitions and the stories behind them. Tours are $5.00 per person. Groups that book a joint workshop and tour will receive a discounted tour price of $4.00 per person. Participants will create their own wooden memory boxes inspired by PGAAMCC’s 2014 exhibition Blazz: Works on Blues and Jazz by Ulysses Marshall. This activity will offer an in-depth look into Ulysses Marshall’s work and teach participants a new method of interpreting their most valued memories. Participants will create a multimedia collage painting inspired by PGAAMCC’s 2014 exhibition Blazz: Works on Blues and Jazz by Ulysses Marshall. Participants will be guided in incorporating Marshall’s themes – blues, jazz, and the African American experience – into their work. This workshop will guide participants in creating three-dimensional wire sculptures inspired by PGAAMCC’s 2014 exhibition Momentum: Sculptures by Huey Gaddy. This workshop will teach the fundamentals of metal working and allow participants to create sculptures that depict or represent movement. *Workshops and tours are scheduled by request during the Museum’s operating hours: Tuesday-Saturday, 10am-5pm; other days and times may be accommodated upon request. An art workshop/activity can be scheduled for tour groups after a museum tour. PGAAMCC Arts Workshops are fun and educational not only for school groups but great for adult/senior groups too! To schedule a hands-on Arts Workshop or tour, contact Treston Sanders, Gallery Program Coordinator, 301-809-0440 Ext: 107, tsanders@pgaamcc.org.